Certain lines from Wallace Stevens’s great elegy for George Santayana, To an Old Philosopher in Rome, capture for me a quality in these paintings by Stanley Whitney: “On the threshold of heaven, the figures in the street / become the figures of heaven.” In his poem Stevens envisions Santayana dying in a Roman hospital, in a half-dozing state where the mind and the ancient city around it—with its street sounds and church bells and ruinous architecture—interpenetrate and become a kind of apotheosis of our creative powers, not so much a city of God as a city of the human imagination, what the poet calls a “Total grandeur of a total edifice.” It is a city both crumbling and whole, like Freud’s image of the subconscious as a Rome whose every historical version co-exists within a single space; and like Whitney’s paintings, it combines structural sweep and fastness with the more accessible markings of individual touch and private expression. 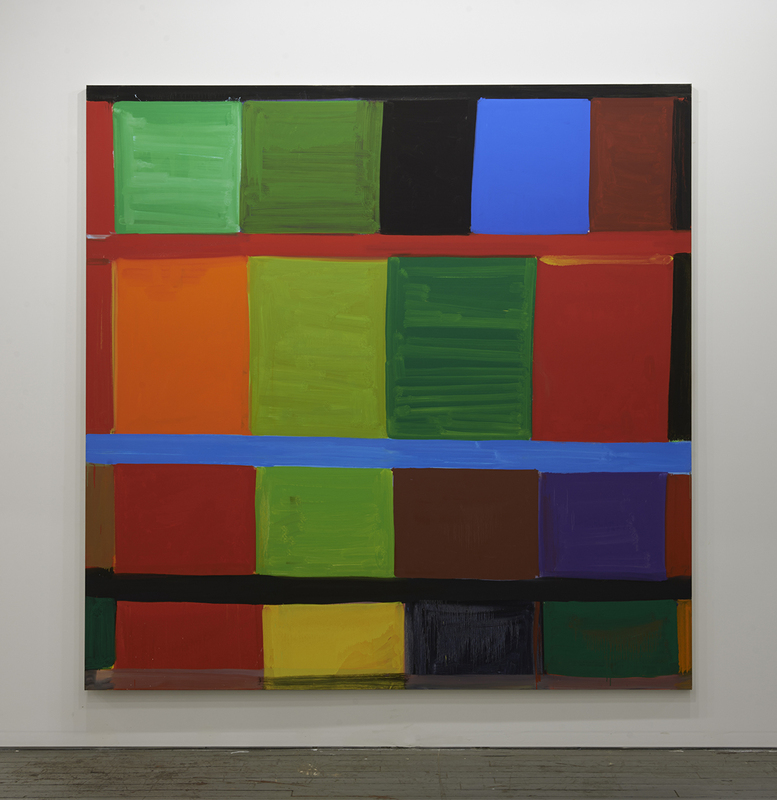 Stanley Whitney, “Heart and Brains,” 2012. Oil on linen, 96 x 96″. Courtesy of the artist and Team Gallery. Photo by Zack Garlitos. Perhaps I think of this passage because I know that Whitney came to this style—where the uncanny hovering immanence of Rothko’s color swaths solidifies into an idiosyncratic matrix for thought and feeling—when he spent time in Italy and Egypt, after a long struggle with figuration and abstraction in and around the post-Ab Ex New York art scene. The lessons of these tutelary, enduring cultures involved color and construction: color as an endlessly recombinant material to signify and suggest relationships and subtleties, a type of language without language, where every “sentence” spoken is a new yet intelligible invention (as in Noam Chomsky’s classic and appropriate example of generative grammar, “Colorless green ideas sleep furiously”); and structure revealing the key to longevity and depth, the stability of a millennia-spanning civilization figured in a display of patterns and adaptable forms. And perhaps because I live in Manhattan, on an avenue running north to south, between numbered streets laid down east to west, it’s difficult for me not to see in Whitney’s loose grids some approximation of this infinitely adaptable form of urban planning, an echo of the rationalizing system that capitalism and land use have spread over the island’s hilly, irregular topography. I don’t wish to push this analogy too far or to suggest that there’s anything schematic about Whitney’s work, merely to indicate that the paintings share some of the city’s organized chaos, its channeling of excitement and impulse. Auden, another transplanted New Yorker, gave the formula for civilization long ago—the maximum amount of diversification within the greatest possible coherence—and Mondrian showed in Broadway Boogie Woogie how the glamour of the city’s electric compression can mirror the painting’s seductive form-and-color tango. Whitney’s stacked hues, with their visual rhymes for skyscrapered windows and city blocks seen from above, provide the lost-in-the-crowd thrill of striding through midtown.